The 2016 Fiji ISA World SUP and Paddleboard Championship was officially declared open at Port Denarau, Fiji, marking making it the first-ever ISA World Championship in Fiji. 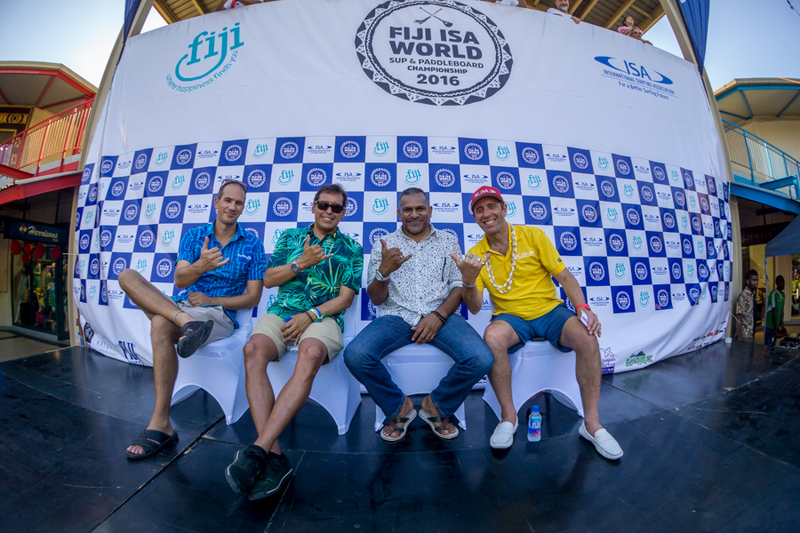 ISA President Fernando Aguerre officially declared open the 2016 Fiji ISA World SUP and Paddleboard Championship along with a representive from each of the 26 participating nations. The 26 National SUP and Paddleboard Teams present in Fiji will kick off the competition on Sunday, November 13 with SUP Surfing at Fiji’s world-renowned wave, Cloudbreak. In attendance at the Opening Ceremony were 244 athletes that travelled from around the world to compete for Gold Medals and represent their nation in the team medal event. Dignitaries present included ISA President, Fernando Aguerre, Fiji’s Minister for Industry, Trade and Tourism, Honorable Faiyaz Koya, CEO of Tourism Fiji, Matthew Stoeckel, ISA Vice Presidents, Karin Sierralta and Casper Steinfath, the latter of which will compete at the event for Team Denmark. The ceremony began with the Parade of Nations, as each National Surfing Team marched along the marina at Port Denarau waving their national flags while ringing out national cheers in unison. The Fiji Police Band led the parade with a taste of local Fijian music. Upon arriving to the Opening Ceremony stage the Fijian National Anthem greeted the international competitors. “I would like to wish the athletes the best of luck for the week to come. A few of you will go home with medals, but each of you is a champion because you have earned the right to represent your nation in this international competition. When you go home, go home as an ambassador of Fijian warmth and culture. “SUP is one of the fastest growing water sports in the world and I am confident that this will contribute to the mainstreaming of the sport at an international level. Next, two members from each team participated in the Flags of the World Ceremony in which flags of every nation were placed in a clear container to symbolize the peaceful gathering of nations of the world through SUP. To conclude the competition, the flag bearer from every competing nation took to the stage and waved their flags with pride as ISA President, Fernando Aguerre, officially declared the competition open.